« A brand new Annoying Burgher! If you watched the Pirates game yesterday late afternoon and early evening, something magical happened. Fans were scared. The Trib said there was “no end in sight” for the tailspin, which is the most ridiculous thing I ever heard. The team held a players only meeting which hinted at desperation. Was this the beginning of the dreaded second-half collapse we experienced last season? commentators bloviated. There was much virtual wringing of the hands over the Pirates’ woes. Yesterday was a must-win game on more than just the win-loss level. More than just the wildcard level. This was a must-win game on the emotional level. This was a must win game that would decide if my bandwagon kept rocking and rolling along or if by morning light it was just me, Woy, and a half dozen people too drunk to jump off yet. 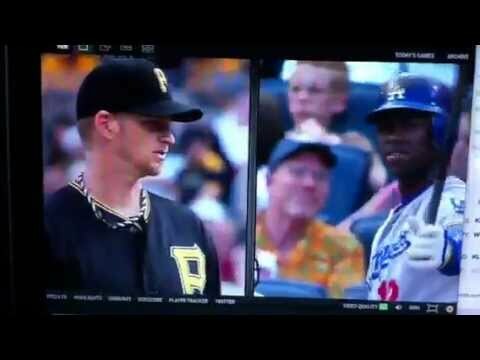 As the leader of the team, AJ Burnett got a little passionate yesterday. He gave up a homerun to Hanley Ramirez at the top of the fourth inning. Rounding second base toward home, Ramirez did his signature eyes move to Burnett. AJ didn’t like this. AJ watched Ramirez do this — watched him round third base and AJ had a look on his face similar to how God looks at Satan. Similar to how I look at pigeons. Garfield looks at Mondays. Lukey looks at Peduto. Then comes the sixth inning. Pirates are up eight to four and AJ strikes Ramirez out swinging. Ramirez starts arguing with the home plate ump. It was glorious and inspired and life-affirming and it was more. It was more. It was AJ showing his leadership. His passion for this team. His desire to win. How much he cares about the Pirates. It was AJ showing how much fight the team still has left despite the rocky road they’ve traveled recently. It was AJ looking at those of you on the bandwagon who are out of your seats, toeing the edge as pothole after pothole lurches you about and rattles your brain, as the bumpy ground rushes by and you start to think, “I don’t think I want to be here anymore.” And you stand there thinking about jumping off. AJ’s talking to you. And he’s telling you there are games left to play and fights left to fight and that the Pirates are still willing to go to battle. He’s telling you to sit the f*#k down. It’s my new motto in life. STFD. The whole thing gave me the chills. I’ve been in that seat for nearly 2 years! I’ll be there for another century if that’s what it takes! I want Buctober! My response to the nah sayers that pop up by the second inning has been …just give’em a little love. And it has worked all season. Hey Pittsburgh…we are NOT fair weather fans! Get out your umbrellas, and …just give’em a little love! I too, will gladly oblige and sit the eff down. And at the season’s end, Buctober or not, I will proudly stand the eff up. For the ovation you and your team so greatly deserve. I took one foot off the ledge yesterday. Hope it carries over vs. Cardinals, but I don’t believe stuff like this does. Every game has to be won on its own, not on what happened yesterday. If there is a team in baseball I REALLY hate than it is the f***in’ Dodgers. That may or may not be because I have my westcoast homebase in San Francisco and like you know … Giants and Dodgers is like Pens and *PATOOIE* Flyers. The LA crap sweepings the Buccos would have made me sick. Very sick. So glad it did not happen. I am sitting on my too big bum not moving at all and this is a LOT because of you. Thank you for playing your heart out. I was at Kennywood on Monday and an older man in line in front of me at the Exterminator had on a blue T-shirt with “STFD” on the back, and I thought, wow, that was pretty damn fast. Christina should get royalties. I’m staying on that bandwagon permanently, too, and I’m relatively sober a large part of the time. I’m sticking to my “worst-to-first-in-two-years” statement, by the way. It’s a long season and I’d rather have the down time now than in the last two weeks of September. Go, Bucs! Slim, smart and sober is no way to go through life, son. Always ready for an Animal House quote, however altered! Note in my, well, note the words “relatively” and “a large part of the time.” That leaves, of course, the rest of the time. If Jack Lambert played baseball he’d be AJ Burnett. Love it. Love them Buccos. Shades of Russell Crowe , puttin’ bums in seats ! One way or another . I loved that game, AJ, and this team. And dammit all if dem Buccos haven’t lost exactly ONE game this season when my son wasn’t in our seats. Good.Luck.Charm. And Jonathan is a genius. Nailed it. As a Yankees fan who got to watch AJ up close and personal for three years I will warn Bucs fans that there is Good AJ and Bad AJ. And you will never know which one you’re going to get. And Bad AJ is VERY VERY BAD. Ramirez is lucky AJ didn’t stick one in his ear hole. I’m getting tired of the Roots broadcasters referring to the team as “Pittsburgh” instead of the Pirates, Bucs, Buccos, or, better yet, “US”. Maybe they should sit down. I designed a t-shirt after this great happening.